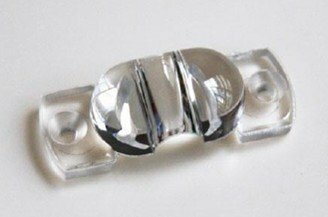 Freeform optical shapes or optical surfaces are gaining popularity with lens designers and optical system integrators. Now, there are optical fabrication processes that include generation, high speed VIBE polishing, sub-aperture figure correction, surface smoothing and testing of freeform surfaces. Farview produces freeform optics from glass, fused silica, crystals and ceramics for UV, Visible and IR applications using proprietary techniques for low scatter surfaces. Freeforms are optical shapes or optical surfaces that are designed with little to no symmetry. Manufacturing a freeform is similar to that of a highly complex asphere; surface form and local slope change are all factors that influence the complexity of the shape and the manufacturing process used.